The differential is a device that splits the engine torque two ways, allowing each output to spin at a different speed. The differential is found on all modern cars and trucks, and also in many all-wheel-drive (full-time four-wheel-drive) vehicles. These all-wheel-drive vehicles need a differential between each set of drive wheels, and they need one between the front and the back wheels as well, because the front wheels travel a different distance through a turn than the rear wheels. Part-time four-wheel-drive systems don't have a differential between the front and rear wheels; instead, they are locked together so that the front and rear wheels have to turn at the same average speed. This is why these vehicles are hard to turn on concrete when the four-wheel-drive system is engaged. The differential is found on all modern cars and trucks, and also in many all-wheel-drive AWD (full-time four-wheel-drive) vehicles. 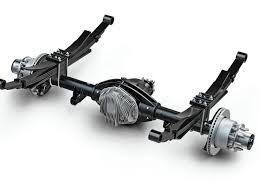 These all-wheel-drive vehicles need a differential between each set of drive wheels, and they need one between the front and the back wheels as well, because the front wheels travel a different distance through a turn than the rear wheels. Part-time four-wheel-drive systems don't have a differential between the front and rear wheels; instead, they are locked together so that the front and rear wheels have to turn at the same average speed. This is why these vehicles are hard to turn on concrete when the four-wheel-drive system is engaged. Car wheels spin at different speeds, especially when turning. You can see from the animation that each wheel travels a different distance through the turn, and that the inside wheels travel a shorter distance than the outside wheels. For the car to be able to turn, one tire would have to slip. With modern tires and concrete roads, a great deal of force is required to make a tire slip. That force would have to be transmitted through the axle from one wheel to another, putting a heavy strain on the axle components.